The patented City Air Purification System (CAPS), jointly developed by Sino Green and Arup, won Gold Medal at the 46th International Exhibition of Inventions Geneva.CAPS won Gold Medal in ‘Protection of the Environment — Energy’ category for its impact on improving air quality in open space. The International Exhibition of Inventions Geneva is widely known as the most important specialist event of its kind, attracting hundreds of exhibitors from around the world to showcase their inventions and innovations. 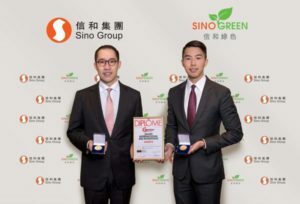 Mr Daryl Ng, JP, Deputy Chairman of Sino Group (left) and Mr David Ng, Group General Manager of Sino Group receiving the award. The prototype CAPS was fabricated in the form of a bus shelter. How it works -air is drawn into the system from an inlet at the bottom, the air current then passes through a bag filter, which is effective in removing fine suspended particles (PM10 and PM2.5), before coming out through the louvre overhead. The system has been designed so that it can build up positive pressure with an air curtain, which acts as a barrier against pollutants. The prototype has been tested in Hong Kong and Beijing, which both experience heavy road traffic and air pollution. The empirical data showed that the system is capable of reducing the concentration of air pollutants within the system by 30% to 70% under various ambient conditions.